this practice, like the first but limited to see only 1 color, mostly white aura. however, it still need lots of concentration and focusing and you will succeed. 1.now, all you need is to sit comfortably( sit on a chair, lie down on bed or sit on floor) with room that the walls and ceiling is painted in neutral color, and have less brightness atmosphere in the room. relax yourself first by breathing in and out slowly till you felt ease and comfort. 2. now, bring forward your right hands toward the neutral colored wall.spread and straighten the fingers. now you need to stares your hands for 30 minutes non stop in first attempt. 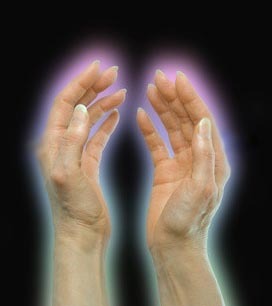 then for the next practice, add 5 minute more and keep this until to one point you finally able to see a small line of white light encircled your hands. with this, you had succeed in the practicing.